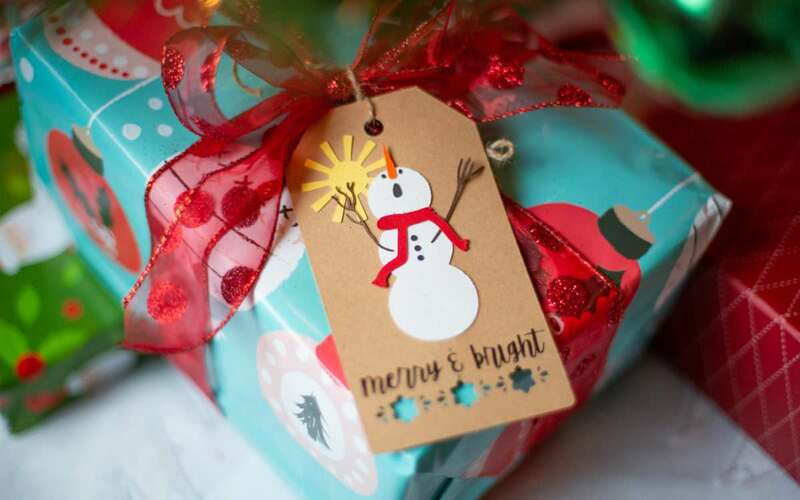 “May your days be merry and bright” might not be such a cheery greeting for everyone, especially a snowman. And a snow globe might not be so fun if you’re the one being shaken up all the time. 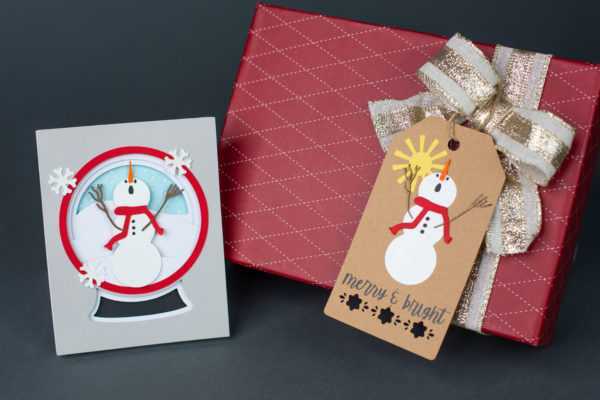 Today we are going to how you how to take a silly snowman design and make a humorous layered card and gift tag. Open the Snowman design (Design ID #280736) and resize it. 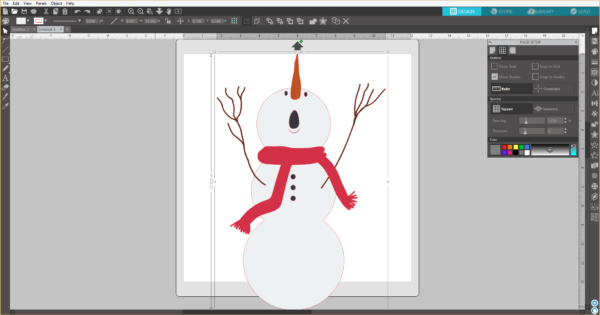 You can do this by clicking on the snowman, and this brings up the size bar around the image. 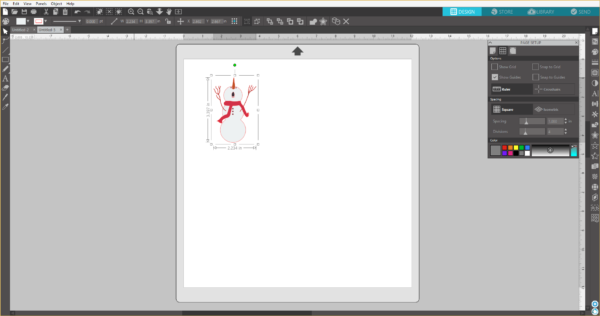 Click a square in the corner and drag it until the snowman is the size you want. I adjusted the size of the snowman to 3.39 inches high and 2.231 inches wide so that it can fit on the card and tag that I picked. Now ungroup the design. This can be done several ways. 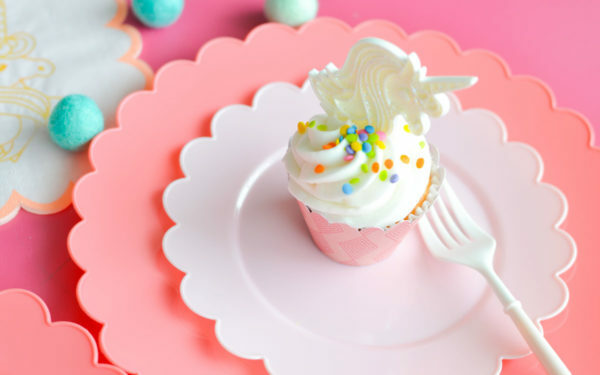 You can select the image then CTRL + Shift + G, go to the menu bar select the Object menu > Ungroup or, the last and most simple way, right-click and choose Ungroup from the drop-down menu. Once ungrouped, separate each piece. Keep items of the same color, such as the eyes, mouth, and buttons grouped. 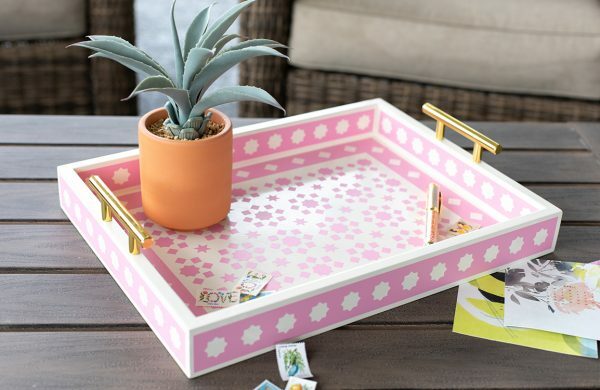 Start by arranging pieces to be cut by color in Silhouette Studio®. 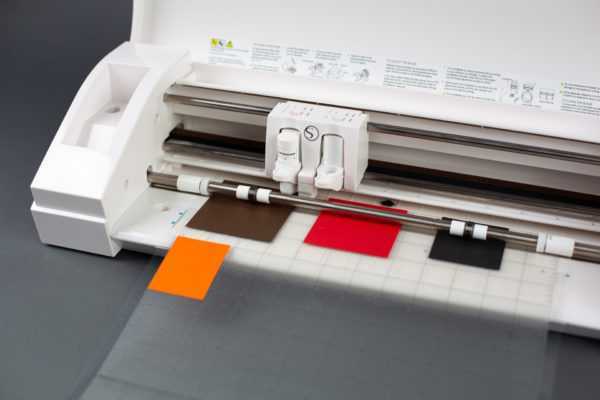 Then place similar materials on the cut mat. I wanted the snowman to stand out a little bit, so I chose a glitter card stock. This means that it need different cut setting than the regular cardstock, so I will cut this piece on its own and cut the regular card stock all at once. 1. 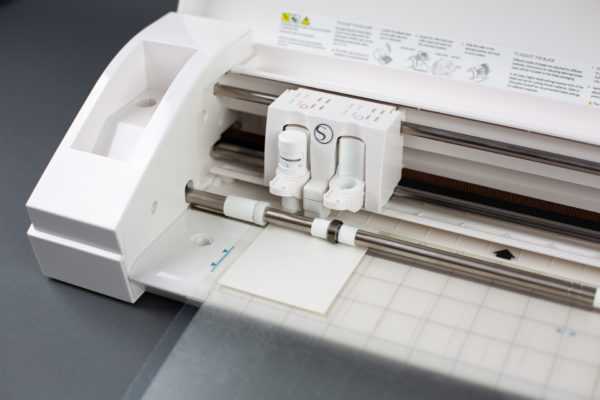 After all of the pieces are cut, remove the pieces from cut mat. 2. 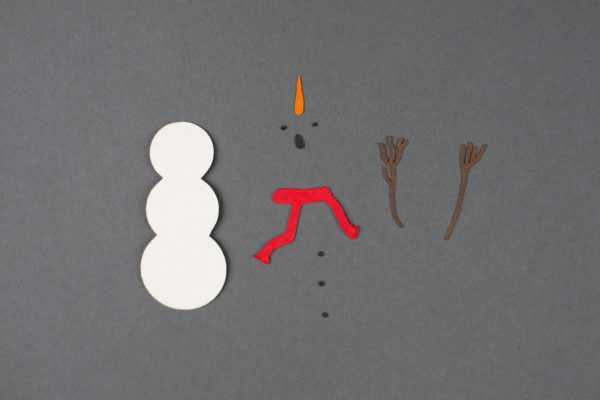 Assemble the snowman using craft clue to adhere all the layers. 3. Finally place snowman on top of desired surface. 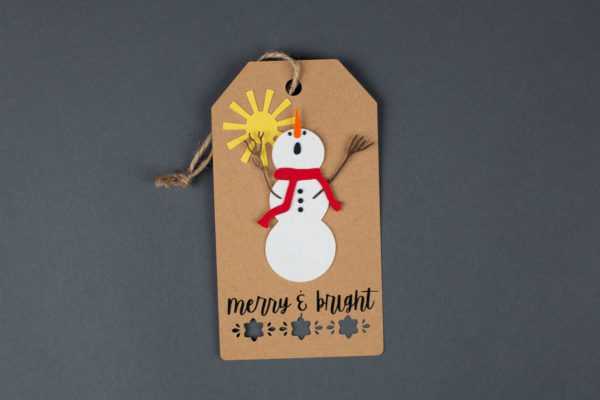 We found this fun holiday gift tag (Design ID #21111) and added a sun design (Design ID #17341) and Merry and Bright greeting (Design ID #281416) to it. 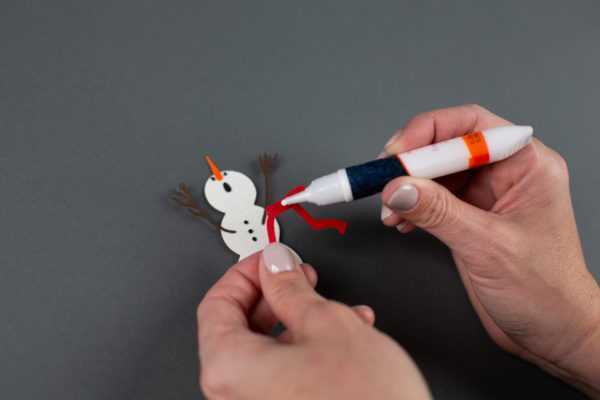 There are so many different uses for this darling snowman. We also placed him in this snow globe card (Design ID #153802) by Lori Whitlock. 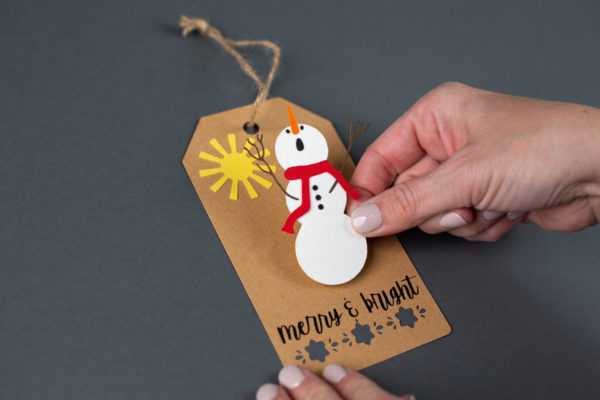 Imagine the possibilities for scrapbooking, bookmarks, or anything else you want to add a little winter humor to. Love the snowman tag and snow globe, going to have to give these a try for next years Christmas swaps!